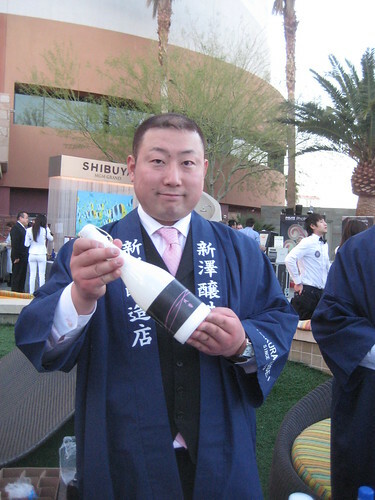 On Friday, April 9th, 2010, I was in Las Vegas for a three-day festival of wine, Champagne and sake co-sponsored by UNLV and Southern Wine & Spirits. My main reason for attending was to experience Sake Fever, a poolside event at The Palms featuring 150 premium sakes. I am a sake enthusiast, and being a Chicagoan, I do not get to experience as much sake as I would like. Sake Fever was a perfect way to taste, explore and compare the best sakes from Japan side by side in one lovely space. Before I go on any further, I want to draw your attention to another post I wrote about sake. I wrote a post entitled Sake 101, for those of you who may want a tidbit of information regarding sake click here & then come on back and read this post. I was fortunate enough to interview a few Tojis from two different breweries. I interviewed Mr. Sugihara & Mr. Niizawa who are both Toji’s from the Niizawa Shuzo brewery. And Mr. Sato from Sakata Shuzo who makes the Jokigen brands of sake. My first interview was with Mr. Sugihara, the assistant to master brewer at Niizawa Shuzo in Niyagi Japan. Mr. Sugihara explained to me that Niizawa Shuzo brewery is responsible for brands such as Atagonomatsu, Hakurakusei, and the notorious Super 9. He explained to me that Super 9 has made appearances amongst the celebrity ranks in the United States but is not yet available for sale in the United States. When Super 9 becomes available in the U.S., it will retail for upwards of $1000.00 a bottle. Mr. Sugihara showed me photos of celebrities handling the bottle of Super 9 backstage at the Grammy’s. It was rumored throughout the event that P. Diddy was a big fan of Super 9. My next interview was with Mr. Niizawa (Mr. Sugihara’s boss), he is the master brewer for Niizawa Shuzo. How did you get involved with sake? How long have you been with the brewery? Mr. Niizawa was born into a sake family and has always been focused on brewing sake. Mr. Niizawa went to Tokyo Brewing School for college. Mr. Niizawa has been brewing sake for 13 years. Mr. Niizawa worked with other brewers, working on his tasting skills, before working for Niizawa Shuzo. He has a very progressive style of brewing sake. His brewery brews only 10 different types of sake. The Goal of his brewery is to produce sakes that are balanced in terms of aroma, flavor and body. Niizawa Shuzo brewery has produced sake for 130 years. Historically, their brand was thought of as lower end brand. In order to make it up to the top three brands in Japan, they worked very hard. Instead of trying to rebuild their original brand, they released a completely new brand. Their first brand is considered more traditional, flagship, everyday sake and the newer brand is considered more of a luxury brand, an experimental sake. What does Mr. Niizawa drink at home? When he's fighting with his wife he drinks wine (laughter ensues). When he drinks his own sake it is an emotional experience for him, therefore, he prefers to drink what others produce. He is very close with the others brewers in Miyagi. It is stressful for him to drink his own sake. He can't help but continually evaluate when he drinks his own sake so he prefers not to drink it at home. It is what work for him. What's the most popular of your sakes in Japan? Most popular in America? Why do u think they are different? Junmai ginjo is most popular in Japan. In the United States people tend to drink Tokubetsu Gunmai. Where do the significant differences lie in the sake category in the U.S. and European countries versus Japan? Sake in us is more expensive in the United States and Europe than it is in Japan. That's why people in Japan tend to move up to the higher level of sake. The jump to the next level in quality does not cost as much as it would in the United States or Europe. In Japan, people focus on the quality of the brewery’s Junmai Ginjo. People tend to evaluate the entire success of the brewery on the production/quality of Junmai Ginjo. I asked about marketing in the United States – particularly the Midwest. Once you allow people to experience sake with food people will like sake. People who experience Junmai's with food, a quality sake that doesn't break the bank, they will feel it is something they can appreciate. Soon Americans will want to try other sakes like the Junmai Ginjo. In Japan, there's a saying "Look into your soul to view what is best". At this point in his career, he can see what is good for his sakes. He is trying to make the best product for people. Tell me about Super 9? Hopes and projected success for Super 9? The launch of their newest sake polished down to 9%, thus the name, Super 9. The level of polishing the rice used in Super 9 was previously unheard of in the sake industry. Daiginjo tends to be aromatic, but Mr. Niizawa made Super 9 to taste like pure starch or “Shinpaku”. He thinks this is a transcended experience. He knows not everyone can experience it (due to cost) but he wants people who can afford to experience it, to experience Super 9. Mr. Niizawa went on to explain that due to the process, there is no way to make the product cost less. What made you think of polishing the rice to a level previously unheard of in your industry? Most breweries send their rice out to be “polished,” Niizawa’s brewery bought a polishing machine so they could polish their own rice in house. This created the concept of “how low can we go” – the answer for them is 9%. After the purchase of the polishing machine, Mr. Niizawa got it in his head; he could not stop thinking about how low he could polish the sake rice. It was after the purchase of the polishing machine, he had to make Super 9. He made Super 9 because he wanted people to taste and experience the "pure starch" flavor of the sake. How do u plan to deal with people who simply buy Super 9 for price point, those who may not be the ones who will appreciate it? We run that risk and Las Vegas is a funny market (Las Vegas is their biggest market in the U.S.). The packaging for Super 9 is very Western. When you price a particular sake at a certain price point, you know people will buy it who don't know what they're doing. We hope that it will move the other products (Atagonomatsu & Hakurakusei) when they associate Super 9 with the other products. Growing the brand along with the others products within the family of products. Next was my interview with Mr. Sato of Sakata Shuzo, makes Jokigen brand sakes, including "Sweet Dreams" a Riesling style sake. A quick side note, Jokigen translates to “happiness” or "euphoria" generally, more specifically, “happiness after drinking”. The Jokigen label is unique. How did you decide on it? The signature Jokigen label is made with women in mind; female sake drinkers. Men know what they're looking for when it comes to sake and they head straight for what they want. Mr. Sato wanted to produce a sake where people did not have to think of the more complex attributes one may consider when purchasing a sake; such as rice styles and details of production. He wanted to produce a quality product that one could trust simply by the label. I asked Mr. Sato about Sweet Dreams, their sparkling sake that is likened to a Reisling. Mr. Sato wanted to develop something people could drink more easily without being serious sake drinkers. Side note about Sweet Dreams… I am not a “serious” sake drinker but I probably have more experience with sake than most Chicagoans, I thought Sweet Dreams was a lovely sake. It was well balanced, not overly sweet and a great sake for meals or even as an after dinner drink. Jokigen at times uses table rice instead of sake rice, which is a rarity, so I asked why? First, affordability. Secondly, they wanted to make a product from rice that is already in the body of the average Japanese person. People already eat table rice all the time, they can metabolize the rice better, the sake is good for their digestion. Mr. Sato went on to tell me that their brewery uses many types of rice, in fact, they use more types of rice than any other brewery in Japan. Why so many types of rice? I asked. Mr. Sato answered, “Same water, different rice brings out so many types of flavors.” Mr. Sato wants to be able to bring a wide variety of flavors to people. I asked Mr. Sato what he drinks at home? Beer! Mr. Sato does not drink any hard liquor - ever. Beer is easier on your body. (In fact, many of the producers told me they do not drink sake at home. Sake is their profession, therefore they choose an alternate beverage when relaxing at home with their wives). I asked Mr. Sato the positive effects that sake may have on your health? For women its good for your skin & your uterus. Mr. Sato said Las Vegas was their top market and then New York. Mr. Sato quickly replied, Los Angeles. Jokigen and Hakurakusei are currently available in Chicago and distributed through Southern Wine & Spirits of Illinois. Contact K Inoue inoue@banzaibeverage.com for more info. It was great to read the interviews with the toji. I am sorry that I missed this year's Sake event at the UNLVino. It was always my favorite part of the tasting, to try all the different Sakes. The Super 9 is certainly very intriguing. Prior to this, the lowest seimai-buai I had seen was 19%. I am very curious about the brewing process with a rice polished so much, as it must be very delicate. And can you really tell the difference in the taste? Is it necessary to polish off that much rice, and do you actually polish off some of the starch? I do wish I had been there to taste it, and learn more about it. Great article Leyla. Surprisingly good Q & A considering the sake "tasting" going on while talking to the brew masters. Glad you kept a clear head though, because I found the conversation about Super 9 to be fascinating. Clearly these guys are milling the rice to unprecedented levels somehow, but does it translate to a better quality brew? Brewing is an art, mastered by these Toji over many years. As Beau Timken says, sake is 80% construction, meaning that simply polishing the rice more doesn't necessarily mean the end result will be better. All simply idle speculation however, since it's not available here anyway. Did you sneak back some samples?? Hey Leyla - nice account of your Las Vegas sake experience. Thanks! My question is: where can one buy a bottle of the Super 9 in the u.s.?? A humankind begins cutting his wisdom teeth the earliest without surcease he bites eccentric more than he can chew. Vex ferments the humors, casts them into their adapted channels, throws substandard redundancies, and helps nature in those secretive distributions, without which the body cannot subsist in its vigor, nor the incarnation fake with cheerfulness.